Princess Elizabeth, Queen of Bohemia and Electress Palatine (1596-1662), Daughter of James I; wife of Frederick V, Elector Palatine. Sitter associated with 45 portraits. 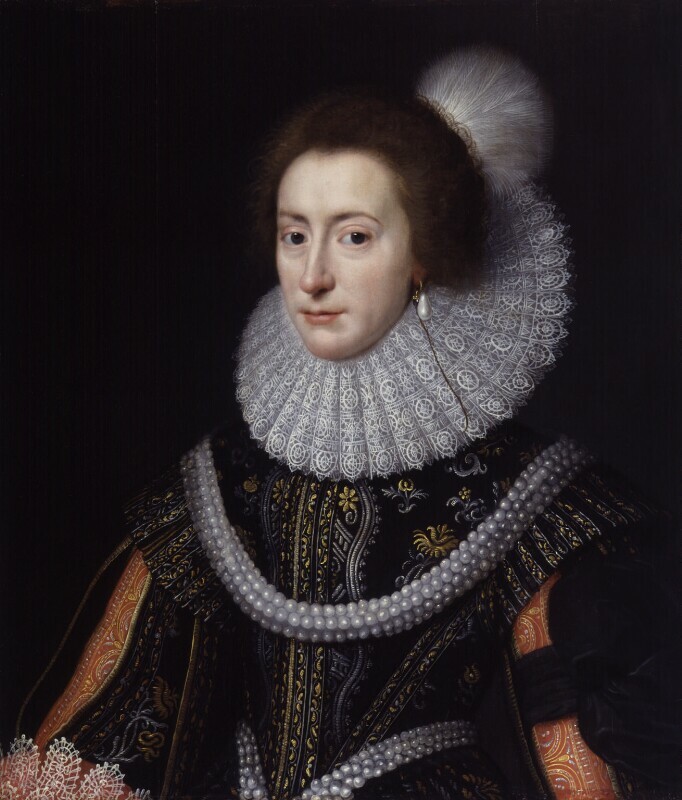 In this portrait she may be shown wearing the famous Medici Pearls, also known as the Hanover Pearls, six strands joined together in a thick rope. The pearls have a long history. They were originally given to Catherine of Medici by Pope Clement VII; she in turn gave them to her niece, Mary, Queen of Scots. When Mary died the pearls were, it is thought, confiscated by Elizabeth I. On Elizabeth's death they passed to Mary's son James I who gave them to his daughter, Elizabeth of Bohemia. Elizabeth in turn gave them to her daughter Sophia on her marriage to the Elector of Hanover. The pearls returned to England with Sophia's son, George I, and remained here until the reign of Queen Victoria. Victoria refused to return the pearls to her uncle, the Duke of Cumberland, when he became the Elector. This led to a court case which lasted for twenty years and which was eventually settled in favour of Hanover. The pearls may never have been returned however. Queen Alexandra wore a choker of them and it is said that Elizabeth II has earrings and a diadem of the same provenance. Charles, Prince of Wales, accompanied by George Villiers, Duke of Buckingham, travel to Madrid incognito under the names Tom and Jack Smith, determined to secure a marriage with Infanta Maria Anna of Spain. They return to England unsuccessful to the relief of the nation. The First Folio of William Shakespeare's plays is published, dedicated to William Herbert, Earl of Pembroke and his brother, Philip Herbert, courtiers and patrons of the arts. Work begins on the Queen's Chapel, designated for Catholic worship, at St James's Palace to Inigo Jones's design. Amboyna Massacre. Traders from the English East India Company are murdered by agents of the Dutch East India Company amid intense rivalry. Banker, Sir Thomas Vyner, acting as co-treasurer, receives compensation from the Dutch for those killed in the massacre.